I tweeted this morning that I was working on updating my spreadsheet of upcoming iOS / macOS developer conferences, which I use to maintain a page of conferences (and anime conventions, because me) over on invalidstream.com. I also got into this research to provide a segment for the sporadic CocoaConf Podcast (iTunes, Overcast) This post is going to be about the changes in that scene I’ve seen recently. So, we’ve had to keep this under our hats for a little while, but yesterday Apple posted their Beyond WWDC page, revealing the co-located conferences Layers, AltConf, and CocoaConf Next Door. The first two of these have taken place the same week as WWDC for a few years now, but CocoaConf making an appearance that week is new. 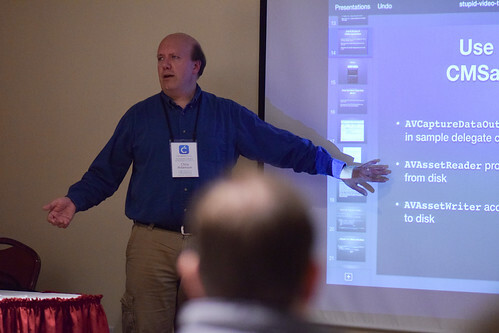 As a CocoaConf regular, they asked me to participate in CocoaConf Next Door, and so I’ll be doing three sessions (and likely some other events). We’re still working out what those will be, as it’s a little tricky to strategize a conference talk the week of WWDC and minimize the chance of it being rendered obsolete by changes to iOS and macOS revealed at WWDC. I mean, it’s not like you’d want to build a talk around view controller rotation-handling for that week, since the “right way” to do that seems to change every couple years. But you also don’t want to do something that’s so evergreen that it’s boring either. I will probably reprise my talk about media frameworks and Swift from Forward Swift and CocoaConf Chicago, because it’s the best one I’ve done in years, and it does get into some pretty interesting areas about the Swift language itself and where it struggles to live up to its ambitions (I blogged about some of this in Render Unto C-sar). I’ll be putting more work into the talk — maybe by June, I can actually get my custom AUAudioUnit working (I’m pretty stuck at the moment, and a DTS support incident did not unblock me). It’s possible that for the last day of the conference, I’ll have a new talk based on things that get revealed on Monday. That would be a great way to keep things fresh, though I want to avoid Janie Clayton’s “First to pee on Mount Everest” syndrome, i.e., being the first to try out some new feature or API, but not enlighten or bring away anything from it except to basically yell “first post!” So, still thinking about how to make sure that’ll still be valuable to attendees. CocoaConf’s blog has details about how they’ll schedule their time around the WWDC keynotes so we don’t miss out on the good stuff (or, god forbid, another 30-minute Apple Music presentation). Early Bird registration is open. It’s $999, which seems pretty reasonable for a four-day conference (CocoaConf is usually like $600 for two days, and across the street, Layers’ early bird price is $850 for three days, to say nothing of WWDC costing $1600). Maybe we’re going to be somebody’s Plan B if they don’t win the WWDC ticket lottery but still want to be in town that week; we’ll make it a pretty damn worthwhile Plan B. Plus, CocoaConf registration includes tickets to the James Dempsey and the Breakpoints concert on Wednesday night. So, I’m looking forward to doing some new talks at CocoaConf Next Door, meeting up with friends in the evening, and certainly hoping that App Camp for Girls’ Jean McDonald finds a suitable karaoke place for her “Core Audio” group of developer-singers (if they have it, I’m calling dibs on “History Maker”). Quick note, before Early Bird pricing ends. I’m speaking at two conferences this Spring. I’ll be at Forward Swift in San Francisco on March 2. There, I’m doing a talk called “Audio Frameworks and Swift: This Is Fine”. The idea of the talk is to look at how well Swift does and doesn’t work as a language for calling the iOS and Mac audio frameworks. This covers things like how to call the C-based frameworks (Audio Toolbox and the other higher-level parts of Core Audio) from Swift, and where you get into some real mismatches between the languages, and what to do about it. I covered this phenomenon on the blog a while back in Radio on the TV. My plan is to write an audio reverser app to demo this, as I don’t think there’s a good way to do that in AV Foundation, meaning you’d want to use either Audio Converter Services or Extended Audio Files from Audio Toolbox. Plus, playing music backwards should make for a fun demo. I’ll also be covering v3 Audio Units, which specifically prohibits you from using Swift in the “kernel” of your AU, since that’s called on a realtime thread and there are all sorts of ways that Swift is not quite yet ready for that kind of use, even though it’s billed as being a systems programming language. I’ll try to make this talk more about the language — what it can and can’t/shouldn’t do, what it’s good and bad at — than the frameworks, to try to make it more approachable. I don’t want this to be a draw only for the people who’ve read the Core Audio book and happen to be in SF that week (if I wanted that, we could just get a table at Super Duper and chat over burgers and beer). Forward Swift early bird registration ends tomorrow, so hop on it if you’re so inclined. I’ll be doing this talk again at CocoaConf Chicago on April 21-22, along with the Firebase talk I did at CocoaConfs DC and San Jose last Fall. 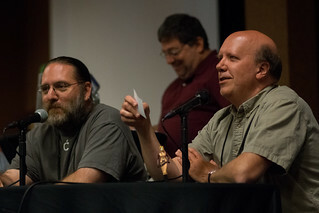 CocoaConf’s early bird ends on February 25. Hope to see you at one or both of these. CocoaConf San Jose starts on Thursday. As with the other stops on the Fall tour, I’ll be doing an all-day class on App Extensions, and regular sessions on WatchKit media APIs and “Revenge of the 80s”, which is about old productivity APIs like cut/copy/paste that have been with us since the first Macs and which we take for granted. This is also the last speaking I’ll be doing for a while. I’m taking at least the first half of 2016 off, maybe longer. OK, sorry, didn’t mean to sound dramatic. But hey, you have to have a hook before the fold. Let me explain where my head’s at right now.